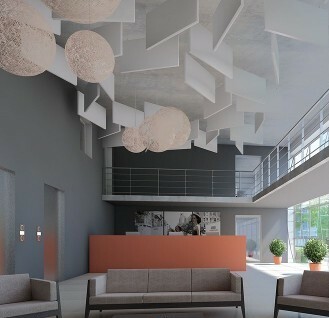 Dampen ambient noise while improving the appearance of an indoor space with Rockfon® ceilings. A leading provider of suspension ceiling systems, Rockfon manufactures both stone wool and metal ceilings. The top-of-the-line products we offer at Couser Supply Inc. decrease noise pollution and create a more pleasant work environment. Noise is distracting for most people, especially when they are trying to work. Although an unfinished ceiling and an open concept design may be the look you are trying to achieve, it may not provide the best environment for employees, customers, and building occupants. Rockfon ceiling tiles prevent sound reverberation and make any indoor space my pleasant to the ears. After installing them, you'll have a room that offers better acoustics and appeal. • As much as 70% of the consonants spoken by teachers cannot be heard by students. • Noise control in hospitals is important to the recovery of patients, because disruptive noises and sound actually increase heart rate, blood pressure and respiration rate. • For employees who work in open office areas, 60% believe that noise is the single most disturbing factor. Maintain a pleasant temperature in your office, school, hospital, or commercial building with Rockfon ceilings. Because Rockfon ceiling systems have a layer of thermal insulation, they keep your indoor area warm in the winter and cool in the summer. This actually helps you save money on your energy bills every month. Make your business both pleasing to the eyes and ears by installing acoustic ceilings. Contact us for more information about our innovative ceiling systems. We proudly serve clients throughout the United States.